Lancing Football Club has been shortlisted for the prestigious ‘Everyone Active Club of the Year’ Award at the 2018 Sussex Sports Awards and it is down to the public to decide their fate. This is the only category to be decided by the public vote and event organisers, Active Sussex, are calling on those wishing to cast their vote to do so before the deadline on the night of the event itself – November 23rd. 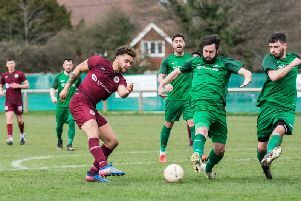 Lancing Football Club has reached Charter Standard this year following the successful merger between the senior team and the youth side, and now run 17 separate teams. The senior men’s team progressed further in the FA Cup than they have done for 12 years, whilst the youth and junior sides are also performing well on the pitch. A new ladies’ team has also been formed and has just embarked on their debut season. The club has paid for coaching courses with the FA for many of their coaches to continue their education in football, which is passed on to their players who number well over 250. In addition, the have also paid for a disabled member of the community to take their Level 1 coaching badge as part of their commitment to inclusion and diversity. The club’s commitment to their community goes further still; with fundraising taking place for SASBAH and CALM (Campaign Against Living Miserably) which has raised has over £1,000. This is part of their ‘You’re Not In This Alone’ campaign which aims to support good mental health, offering free entry to matches for anybody that can benefit from being part of the Lancing football family. Believe: Achieve is the theme for the 2018 Sussex Sports Awards which is to be held at The Grand Hotel on Friday November 23rd - this year has also seen a record number of nominations from across the county.